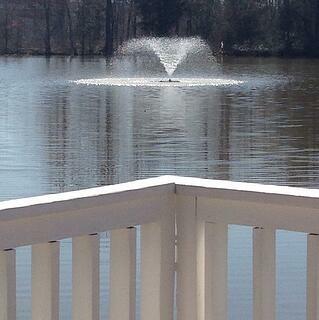 I’ve never seen a lake or pond that did not benefit enormously from aeration. In fact, aeration is the one expense that can make the most improvement in the appearance and productivity of a lake or pond. However, property owners are confused about which type of aeration is most suitable and cost-effective for their situation. This summary provides some basics to help you decide which system you prefer. More detailed information will be provided in additional articles about specific systems. Dissolved oxygen is critical for plant and animal respiration, and problems arise when it is limited. Oxygen gets into lakes and ponds through diffusion of air at the water's surface and from green plants, through photosynthesis. Diffusion at the water/air interface is greatly increased by moving water, ripples and splashing. Most oxygen supplied by plants comes from microscopic plankton, filamentous algae and submerged rooted plants growing in shallow water. How is oxygen lost in lakes and ponds? Lakes and ponds are depleted of oxygen in several ways. No oxygen is produced in water too deep for light penetration. Aquatic plants, including plankton, consume oxygen for respiration at night. Fish and all other aquatic animals are constantly “breathing” oxygen. Multitudes of bacteria probably consume the most oxygen as they digest organic matter such as dead leaves and tree litter, aquatic animal waste, chemicals and even other bacteria. Another complicating factor is thermal stratification in lakes. Warm water is less dense than cold water and actually “floats” on top of cold water. Very little mixing occurs between layers and deep lake water is often very low in dissolved oxygen. Aquatic life is restricted to the upper few feet of water or it dies. Without oxygen at the bottom, toxic gases and excess nutrients are released that contribute to nuisance algae, odors and surface films. The entire lake is unattractive, unproductive and problems can be expensive to correct. Many methods are being used to aerate lakes and ponds. A few of the most popular and most effective methods are described below. Most of our customers prefer: surface aerators, fountain aerators and compressed air supplied through diffusers. Aquaculture applications include: paddlewheel aerators, direct oxygen diffusers, surface aspirators and venturi air injectors. Other special applications require: pumped waterfalls, underwater circulators, air injected into deep “U” tubes, ozone injection and many other developing technologies. If you have an unusual situation, a different method might be applicable and we will be happy to discuss your options. These relatively efficient units use an electric motor suspended beneath a plastic float to push high volumes of lake water a short distance into the air where the water can absorb oxygen. Since the water is pushed only a foot or two into the air, the spray is not as attractive as a fountain. However, much greater volumes of water are circulated improving aeration. In addition to exposing large volumes of water to the air, they increase circulation (increasing oxygen diffusing from the air) and break down surface films. Ugly surface films caused by pollen, dust, algae, cyanobacteria, tree litter and insects are pushed to the shoreline by ripples and quickly sink. The splashing water muffles noise from traffic, neighbors or equipment. However, the spray pattern is not dramatic and “showy” and lights are not appropriate. 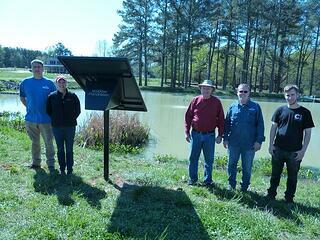 These units are most often used in shallow lakes and ponds. Some units can be placed in water only 18 inches deep, but they are often used in lakes up to 8 feet deep. Some systems offer optional intake collars that pull deep water to the surface to reduce stratification. A basic one horsepower, double propeller unit that sprays roughly 1,000 gallons per minute 1 – 2 feet high will cost in the neighborhood of $1,400.00. These are “hybrid” devices that provide much of the attractiveness of high-pressure fountains while still circulating large volumes of water through the air where oxygen is absorbed. Recent design improvements provide many spray patterns with high volumes of water being pushed by energy efficient motors with up to 5-year warranties. Lights add significantly to the cost, but are incredibly attractive. Some LED light sets are programable for many different light colors and patterns. Fountain aerators are used when dramatic attractiveness is desired in addition to surface aeration. Like surface aerators, the splashing water sound, surface film reduction and optional deep-water intake collars add to their popularity. The general cost of a one-horsepower unit with crown & geyser spray pattern (9 feet high and 24 feet diameter pumping about 500 gallons per minute) without lights is somewhere around $4,500.00. Adding lights would cost about $1,700.00 more. A steel control panel containing all GFCI breakers, timers and controllers is included. These systems are incredible. They can provide up to 3 to 5 times more dissolved oxygen than other methods. A one horsepower motor can circulate 8,000 gallons of water per minute. A properly designed system can eliminate thermal stratification, reduce “muck” accumulation on the bottom, improve water clarity, improve fish production and reduce surface film. Recent developments of probiotic bacteria/enzyme products actually provide “biological dredging”. A one horsepower unit can aerate and destratify a 10-acre lake! The important factor is lake depth. Special “synergistic airlift diffusers” create rising columns of bubbles that expand as they rise through the water column. Each bubble gets larger and the column of bubbles spreads out pulling vast quantities of “dead” deep water up with them. Oxygen diffuses from the bubbles into the water and more air enters as the surface water is circulated. The surface boil of bubbles (only evidence of aeration in operation) may spread out as much as 100 feet. An on-shore compressor (in a fan-cooled cabinet) provides air to the diffusers via special plastic tubing. Although more efficient in deep water, smaller multiple diffuser units can be used in shallow water. Most systems we install cost $1,200.00 – 3,500.00. Until recently, electricity must be provided for each of these aeration systems. Usually, a meter base or junction box needs to be provided near the shore of the lake or pond. Often motors up to one horsepower can use 120-volt supply. Larger units must have (and smaller units can use) 240-volt power supply. The cable must be sized according to the amperage of the motor and length of the cable. Ground fault protection must be provided because of the proximity of water. Solar powered units, such at the PondHawk we sell, avoid the need for an electricity supply. These cost estimates are very rough. Desired options, motor size, cable length, choice of lights and the shape and depth of your lake or pond will determine your cost. Here are some questions you must be able to answer. Prioritize your objectives. Rank the following in importance to you: a.) aeration efficiency, b.) dramatic (showy) appearance, c.) initial cost, d.) destratification, e.) algae control, f.) water quality improvement, g.) muffling extraneous sounds, h.) lights, i.) operating cost, j.) odor reduction, k.) natural (discrete) appearance and l.) muck reduction. Determine your power supply needs. Unless you choose the solar option, electricity needs to be supplied as close to the shoreline as possible. Do you have (or can you get) 120-volt supply or 240-volt supply or both? Would you prefer to supply an electrician or do you want us to supply one? 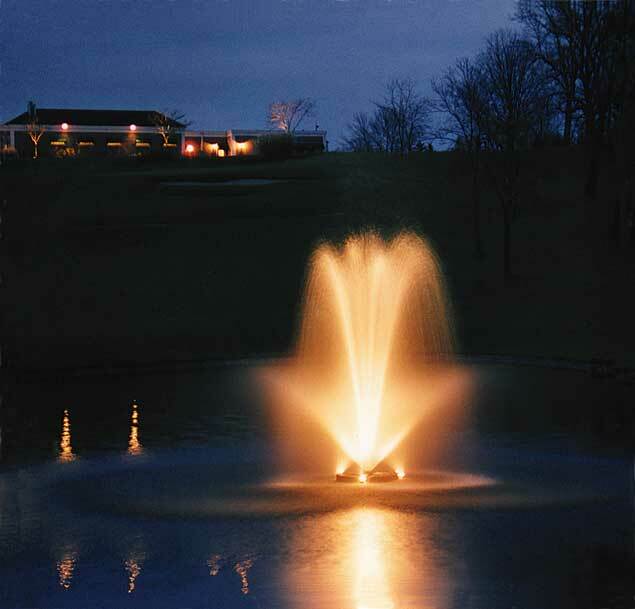 If you choose a fountain aerator, do you want lights? How many? What color? How much electrical cable will you need? What is the distance from your existing, or anticipated, power supply to the location of the aeration unit motor? Simply knowing the address of your lake or pond allows us to use Google Earth to measure the water body and determine the shape. If you can provide some depth information, we can map out the most efficient system for you and create a firm cost estimate. Although somewhat complex, choosing an aeration system is by far the best thing you can do for your lake or pond. After installation water conditions will continue to improve each year. All of these systems are easily installed and we can provide custom installation. Your lake will be much more attractive, more fish will grow faster and the life of the lake will be extended. You can easily pay for the aeration system with lowered maintenance costs year after year. Please don’t hesitate to contact us if we can provide more information or answer your questions.